Hi I'm Fi and welcome to The Cubby Hole. 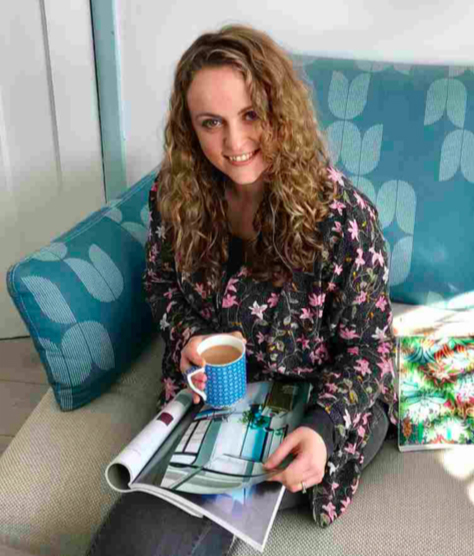 I’ve spent the last 6 years styling and designing sleep, play and study spaces for some of the leading children’s furniture retailers in the UK. Now a proud mum myself I’ve not only thought about this more but been able to help friends and parents who’ve contacted me to design individual and inspirational rooms for their children. Here I’ve put together some “styling boards” which highlight some of the fashionable trends and best furniture solutions out there for Spring 2018. Pack your suitcase and off we go! How fabulous does the Fargo high sleeper look in this room, with nifty pull out sofa?! - The perfect spot for lounging about, dreaming of summer holidays and lazy days. 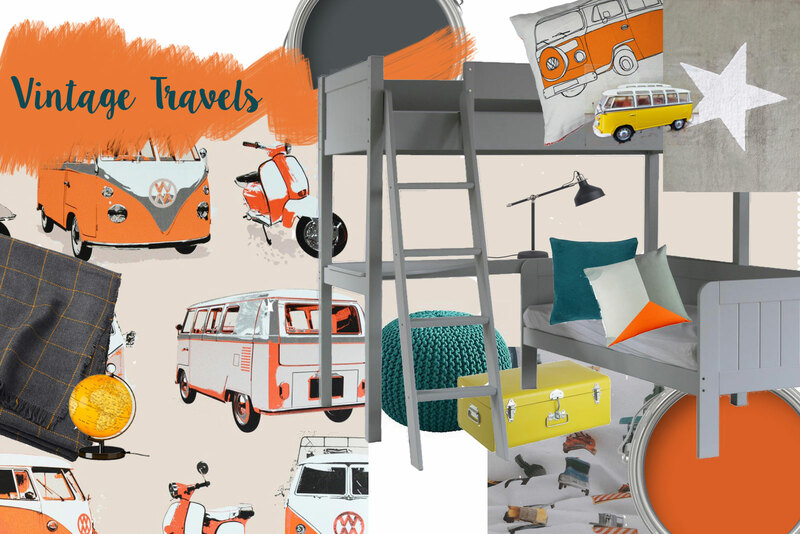 This super cute wallpaper design with retro VW campervans and scooters is the ideal backdrop, and the burnt orange zing provides a subtle twist on a classic red palette. One thing's for certain this season (if not the weather), GREY is here to stay! For the more daring among us, a dark hue on the wall would be simply gorgeous against the bed's pale grey tones. Well, I'd be lying if I was saying you hadn't seen this bed before. Here's a great example of the power of decorating! It's the same bed colour but with completely different room decor. 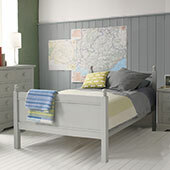 - Hints of Inky blue indigo give a trendy look to this otherwise subtle palette. 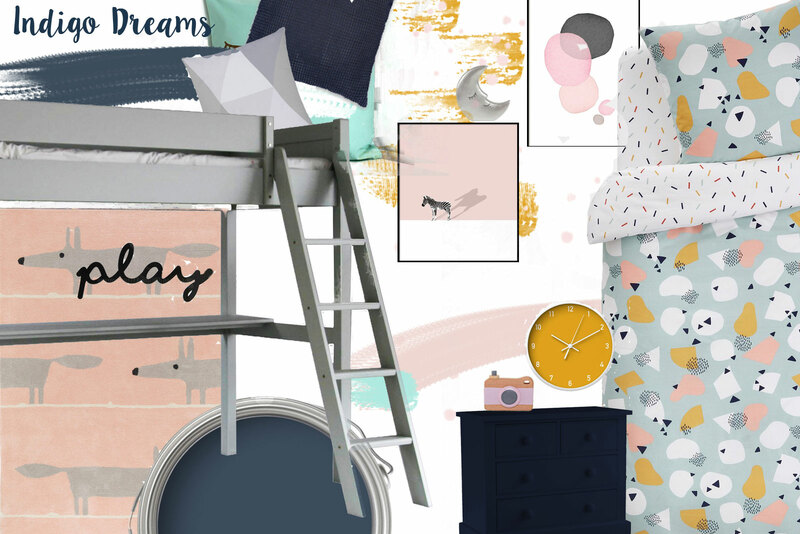 A beautiful pairing with blush pink and soft grey, why not try a 90s inspired bedding design such as this painterly print, for a hint of urban retro? 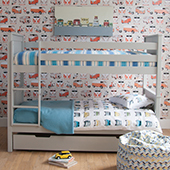 The flash of blue is the ideal addition for little ones who are looking for more of a 'grown up' room, and the mix and match idea with the blue furniture and grey Fargo bed (both from Little Folks) adds a quirky touch. 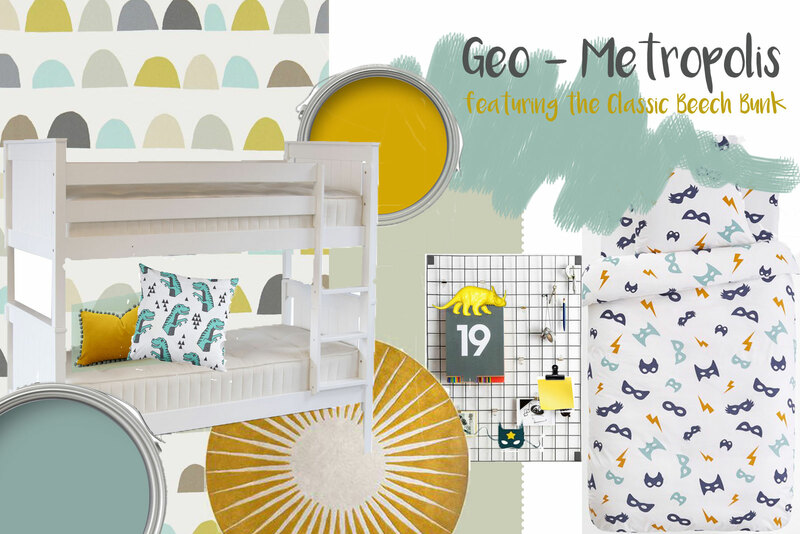 Taking colour inspiration from the recent Scandi Industrial trends, why not create a fusion of design influences, from geometrics through to superheroes AND dinosaurs? - The more the merrier in this fun room design! Whilst heavily themed rooms can often help frame and create a distinctive look, by keeping a simple on-trend colour palette of Mustard, Mint, Navy and Grey, 'anything goes' in this room (including that oh-so-essential Superhero mask; a budding hero must always be prepared!) 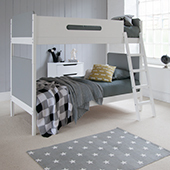 Little Folks' classic white beech bunk bed is just the perfect solution for this laid-back urban cool space with layers of colour and texture. 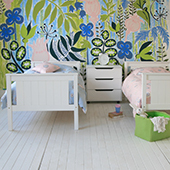 If you think you know how you’d like to design you child’s room and just need some adhoc advice, I’m just a phone call away. Book in a 1 hour Skype or Facetime call following this link. The more information you can provide the better I can help, and the cost is £30 including VAT. Alternatively I can work on a design brief for you and provide design boards for you to follow. Our children grow up very fast so get creating!